Hi everyone. I just came across this slightly-decapitated baby at a surplus sale at a pretty unbeatable price. 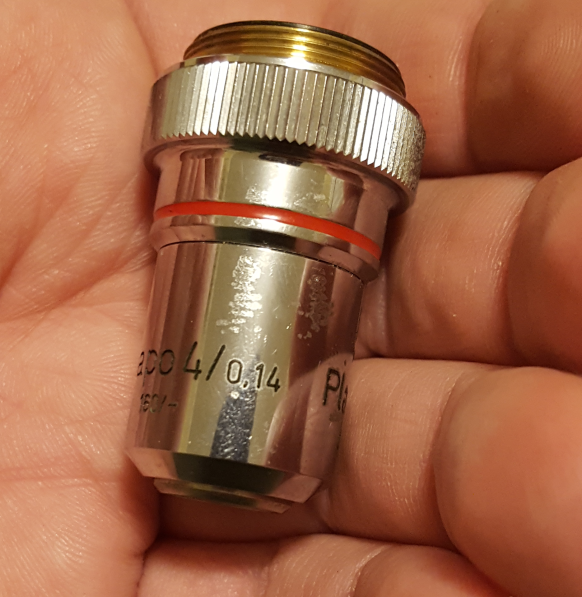 I don't really deal with compound scopes much (I have an AO one-ten that I haven't even gotten to try out yet), so I am not really sure what to do with it. I know Zeiss is a good name, and planapo is already nice. It has five objectives, all planapo: a 4/.14, a 10/.37, a 25/.65 , a 40 / 0.95 and an oil 100/1.25. 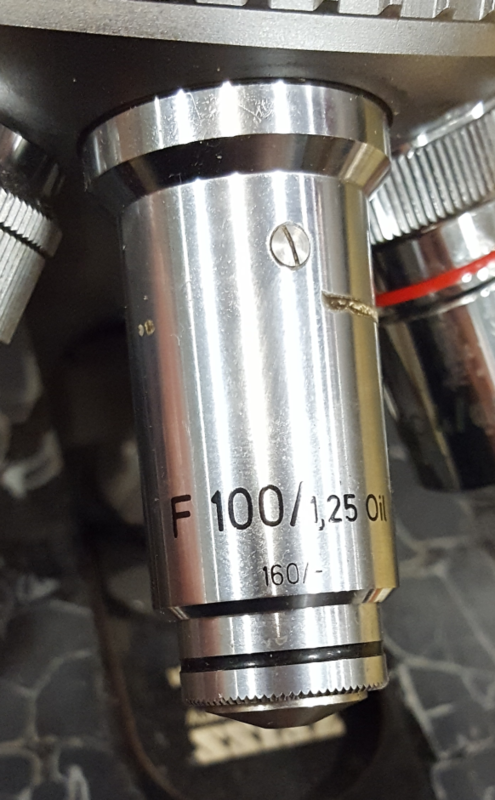 Regrettably the oil objective appears to have oil in it, and the 40x looks like it might have some delamination. I can see a clear image through the center, but holding it up to my eye it looks like there are some shenanigans around the edges. So I am not sure what I should do here. Should I get a head for it to see how things look, or just piece it out? 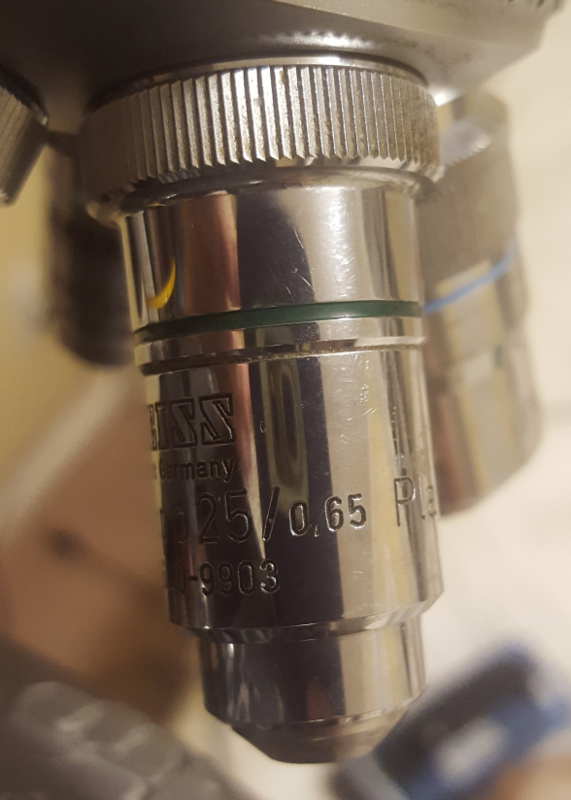 I'm also not sure if the oil objective can be cleaned without ruining it. The 25x0.65 objective is IMO the most interesting item, together with the rotating stage. Your 4/0.14 may be useful for macrophotography, but it may require a compensating eyepiece to produce good image. Other objectives are too powerful macro subjects. 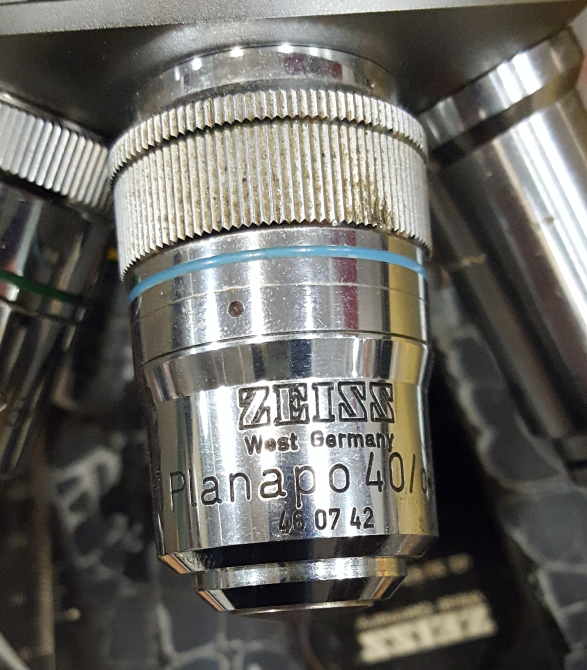 Your 100/1.25 may not be a planapo (it NA is unusually low for a planapo from that Zeiss series), does it say "planapo" on it? 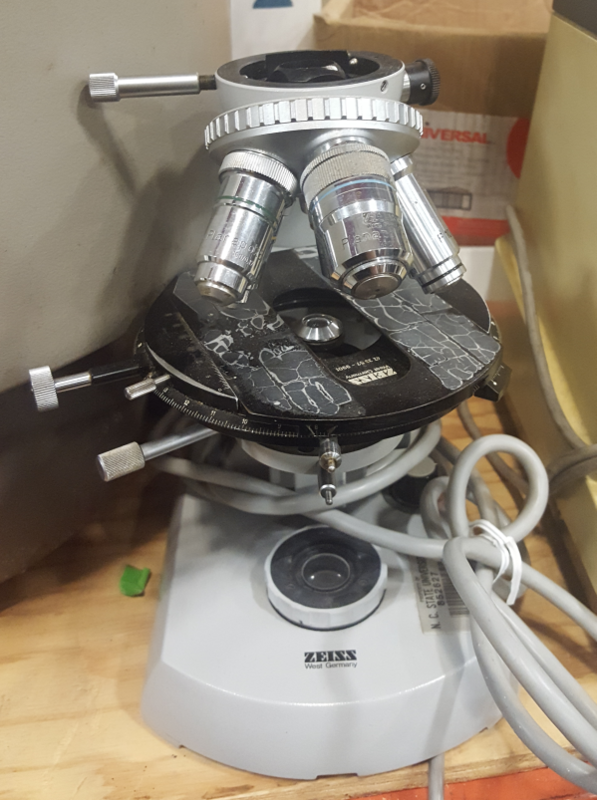 https://m.ebay.com/itm/Carl-Zeiss-plana ... 3095868891) . If it is delaminated, you may not be able to get $60 from it. Maybe better to part it out and sell it. Or trade it. You are dead right, I got overexcited--the oil 100x is not a planapo after all, just the other four. Can anything be done with an oil-contaminated objective, or are they basically dead? I haven't done much else on them, but I got a nikon finite head in recently which I held above the zeiss base to get a baseline sense of how functional they are. It looks to me like only the 40x is suffering from delamination, and it does show in the image it produces. The other three seem to produce good images (at least, when accounting for the mismatched optics and improvised nature of the test). 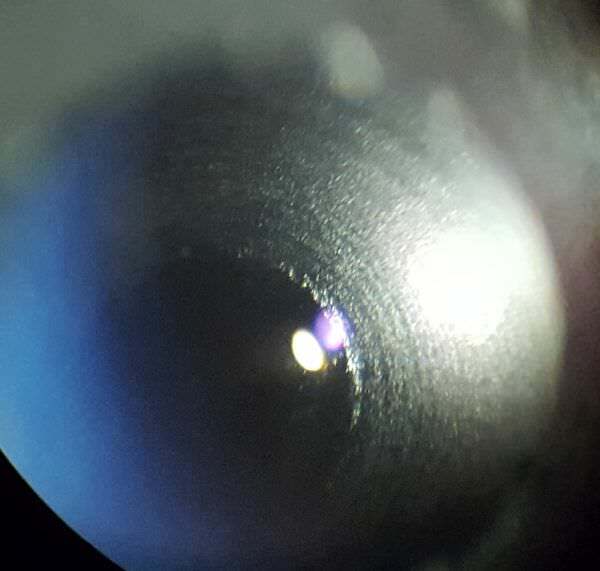 I tried to take some pictures through the eyepieces but it was difficult to position the camera and hold the head in place at the same time, so they didn't really turn out. 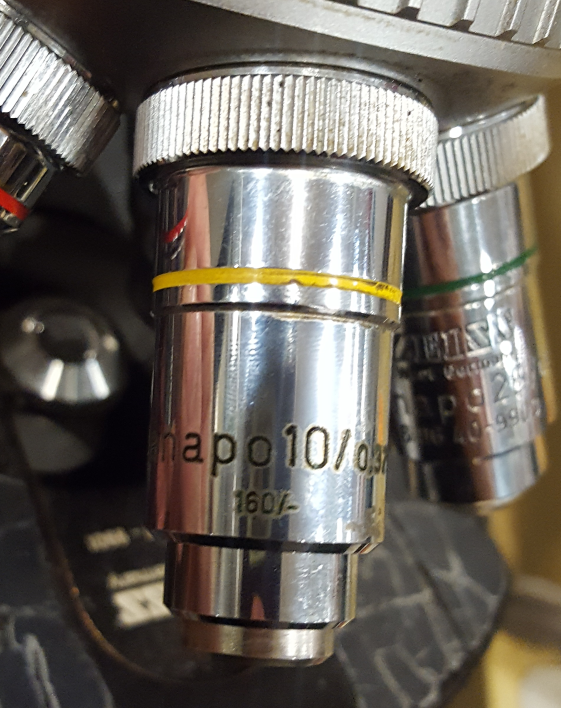 I appreciate the help on this--I think I'll probably piece it out, since I've already got another microscope project going that I'd rather focus on. First I'll need to take a proper look at them under my stereoscope per the article just to make sure I'm right about the delamination though. 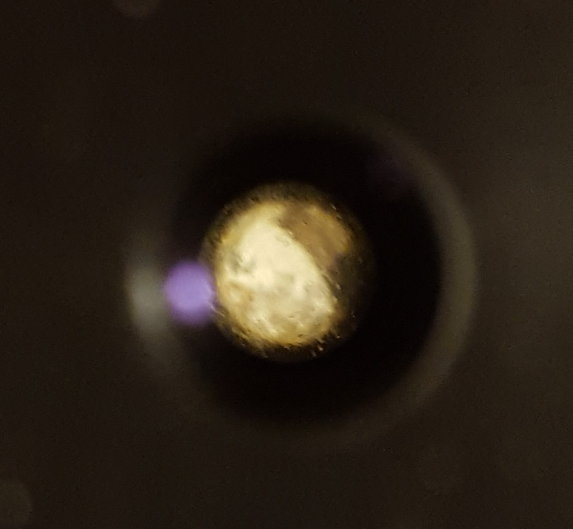 (I was also perplexed by what looked to be a frosted glass surface inside the objectives, which was just the projected image of the glass bottom of the brightfield/darkfield condenser in my gemological microscope--lots to learn here). I am assuming that must be what this is, given the concentric grinding marks and such. No wonder there are issues around the edge of the image if you hold it up to your eye and tilt it! On the plus side, I think I only saw a single spot of what looked to be delamination per the example posted in the 25x objective, and it was pretty marginal. Presumably the issue in performance on the 40x had more to do with hand holding a nikon head above a zeiss base than anything with the objective itself. They are all fairly dusty but no mold I could see either. Thanks everyone! I really appreciate all the help and knowledge you've shared on this.